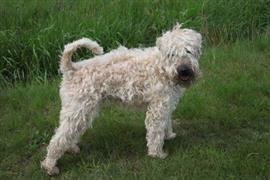 The Soft-coated Wheaten Terrier came from Ireland where its primary role was in herding and protecting livestock. If you are having trouble coming up with a name for your new Wheaten puppy, many great options can be derived from this Terrier’s Irish roots. Another idea is to take the herding origin and look into names related to farming and ranching. Often referred to as a Wheatie, the Wheaten Terrier is well-known for its soft coat. For a puppy, the coat can vary in color greatly, but as the pup begins to mature the coat will end up a wheat or white color. For this reason, it is best to avoid color related names based on the coat of a puppy. Some of our pages will contain a subcategory. A subcategory is a slightly more specific grouping than the main topic of the page. For a subcategory, we will include a separated table of names and corresponding descriptions. An example of a subcategory of Red Dog Names would be 'Dog Names Inspired by Red Wines'. If you have any subcategory ideas for the Wheaten Terrier Names page, we would love to hear them. Use the form below to submit your ideas.